View our collection of commercial market and patio umbrellas on sale today. Our commercial umbrellas are found at swimming pools, hotels, restaurants and outdoor parks across the USA. Commercial umbrellas last longer and provide complete shade compared the cheap ones from discount retailers. Get out of the rut of regularly replacing umbrellas because they break or the fabric rips. Buy the best today! Fiberglass rib market umbrellas give commercial umbrellas strength and flexibility. Our fiberglass umbrellas are wind tested and the best umbrella for use in a commercial environment. A trim market umbrella with wind vent and fiberglass ribs combined with Sunbrella fabric are guaranteed the best commercial umbrellas you can buy. 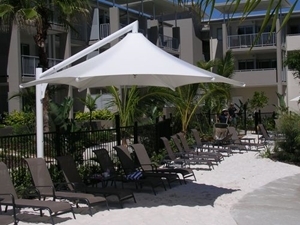 Our commercial grade aluminum rib umbrellas are a great solution for your hotel, resort, or HOA poolside. The aluminum ribs are square to create greater durability against harsh weather and abuse. Commercial Patio umbrellas provide shade for your outdoor patio. Commercial patio umbrellas are convenient to shade pool decks, patios and residential outdoor settings. Our specialty umbrellas give shade where a normal umbrella may not apply. The offset 10 foot square umbrella works well over cafe tables where shade is important without using a pole in the center of the table. Skyspan Umbrellas give large permanent shade options for pool decks, water parks, and recreation areas where relaxation in the shade is needed. Commercial Grade Shade Structures from Park Tables provide high quality structures for your park, playground, school, or bus stop. Be sure to anchor your umbrella properly with a heavy base for freestanding or use a Ubrace® for safety when using your umbrella with a patio table.